This week I was in Palm Springs and San Francisco for a wedding and to spend time with my girlfriend Jessica. I also hoped to squeeze in a little west coast birding along the way. Palm Springs was hot hot hot...about 110 in the daytime, although it cooled off a lot at night. We stayed at a very nice little pensione called Korakia, which is Morrocan-themed and so has lovely pools and palms and landscaping. This all turned out to be good for the birds. I was up before daybreak the first morning, and watched as the birdlife picked up and got busy before the mid-day heat arrived. Besides the ubiquitous pigeons and sparrows, there were a pair of Cactus Wrens, a Bewicks Wren, several hummingbirds (definitely Annas, possibly a Black-Chinned), and a Verdin. Great Tailed Grackles and Common Raven also sailed by. Once 8 or 9am came, everything quieted down considerably due to the intensifying heat, and so we spent the rest of the day relaxing and swimming, and then attended (and photographed) the rehearsal dinner that night. At four am the next morning we awoke and got into a car we had borrowed, and then made the two hour drive down to the southern tip of the Salton Sea. Tom Stephenson had been kind enough to recommend us to some experienced birder friends of his, Nick and Mary, and they happened to be doing a scouting trip that day to prepare for the tour they were leading the next. We stopped for some gas station donuts and coffee, and met them at their motel. On our drive to the sea itself we stopped to see several burrowing owls perched outside of their burrows which were made in the roadside embankments. This included an adolescent, whom Nick and Mary said was the first that they had seen. 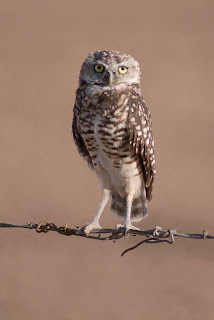 These were my first views of any burrowing owl, and they were all interesting to me. We continued on to the Sea. 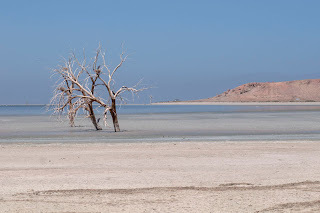 The Salton Sea is a vast lake that is at once strange, grand and dismal. It's a body of water initially created by the delta of the Colorado, which has since been completely diverted for the rapacious water requirements of the cities and agriculture of the west. 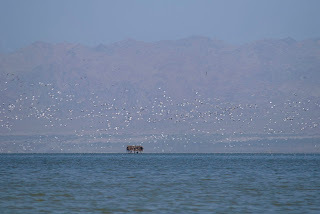 Before that, either the Salton or the delta created a stopover for millions of birds...now the Salton is their only choice, and that itself is drying up. The lake is sustained only by agricultural runoff from the farms around it...when we flew in we could see the green valley created around the Salton, and the vast desert that surrounds it. 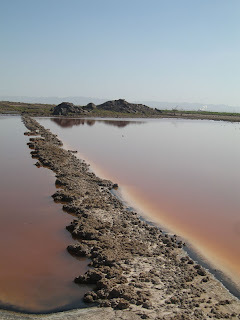 The runoff contains some pesticides, and is apparently insufficient to maintain the lake's water levels, so there is a continuous receding that leaves behind alkali flats that can be bizzare and beautiful, but lifeless. Along the lake itself, the avian life is vibrant. 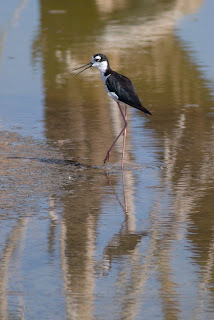 Thousands of Black-Necked Stilts work the shallow waters for food, along with flocks of peeps, more thousands of P elicans (both brown and white), and similar numbers of Gulls. 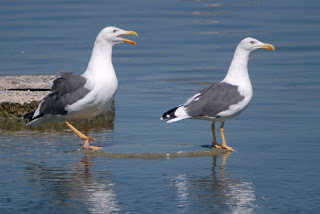 Among those gulls is the special attraction of the Salton Sea...the Yellow Footed Gull. These birds breed in Mexico, but some spend their post-breeding time at the Salton Sea, and it's the only place in the U.S. to see them. Through the morning we encountered a couple of dozen Yellow-Foots, and got really great looks through our scopes, as well as some photos. Other highlights were the Western Sandpipers (here they were hoping for a Semipalmated among the Westerns, while in Jamaica Bay we sift through the Semipalms hoping for a Western), dozens of Phalaropes (Wilsons and Red-Necked), hundreds of Avocet, a couple of hundred Marbled Godwit, thousands of White-Faced Ibis (as opposed to our one at Jamaica Bay, but again a Glossy Ibis here would be rare), and dozens of Long Billed Curlew. 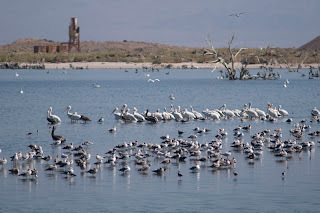 It was the numbers that were most gratifying to me, though...to see a flight of several thousand pelican rising up like a white cloud in the distance was dramatic and gratifying and memorable. Counterbalancing that sight was getting a breath of the hot, sewer-like stench that can come off of the Sea, standing in swarms of flies, while watching a group of park rangers retrieving sick pelicans for rehabilitation, Many thousands of these birds died a few years ago due to an avian botulism outbreak, and it was unclear if what they were doing was related. I don't know what the facts of the place truly are, but there was a strong contrast between the bustling bird life and the feeling of decay and death as the sea shrinks around them. Our last stop was a group of natural mud pots that were in a nearby dirt field. This is the sort of thing that you would normally see as an attraction, with a fence and boardwalk and explanitory plaques, but here we just hiked right up to them and peered in. 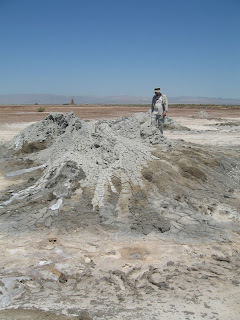 The area were were in runs along the San Andreas fault, and so there is a l ot of geothermal activity. In fact, we saw several geothermal electic generating plants on our drive along the lake. So here was some concrete evidence of that, complete with comical burping sound effects as the liquid mud was forced up to the surface. This is part of what is so strange about the Salton Sea...clearly there is a lot of man-made environmental damage going on here, but at the same time it's a brine lake in the desert along a fault line, so there is a lot of natural desolation as well, and my understanding of the place wasn't great enough to easily separate the two. That night was the wedding, and it was lovely. We danced under the sky and drank good red wine, and all had a wonderful time. The next morning we were off to San Francisco, to stay with Jessica's friends, see my sister, and relax for a day or two. 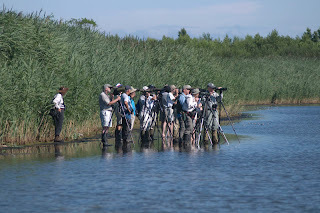 Of course, relaxing includes birding, so we did a bit of that as well. At the Ferry Terminal we had a delectible outdoor lunch from the farmer's market while watching a curious and hungry Heermans Gull take bits of bread from not two feet away--an excellent way to study plumage. We had Western and California gulls, Brewers Blackbird, and a couple of Red Faced Parakeets fly over. These Parakeets are the famous Parrots of Telegraph Hill, about which there is a book and movie, and although we also went to Telegraph Hill, we never got truly good looks at them. Later we went to the beach and looked for Elegant Tern and Snowy Plover, but without success. We did see lots of Heermans Gulls, a cluster of Ravens, and hundreds of Cormorant and Pelican roosting on the big rocky outcroppings that sit just off the coast. In Golden Gate Park we had Chestnut Backed Chickadee, Pygmy Nuthatch, and Bushtit (yes, that really is a bird). In between all that we had some excellent burritos and generally enjoyed ourselves. Change is the constant and so today I'm on a plane hurtling towards New York, making a crosswards migration back to my Big Year. 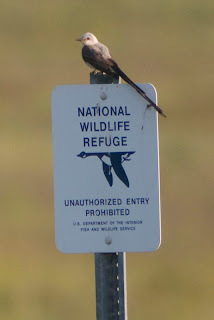 Last week we had a pair of interesting birds at Jamaica Bay. Once again I got a text from Shane Blodgett, and followed his find. This time it was White Faced Ibis, as found by Shai Mitra a couple of days before. I had hoped to find this bird earlier in the season, since it is easier to ID then. Now that the Ibis are generally out of breeding plumage, the marks have become fairly subtle. Specifically, the White Face Ibis shows a red eye and pink facial skin, while the more regular Glossy Ibis has a dark eye and face. I was apprehensive about finding marks like these, especially on my own and from a distance. I arrived at the East Pond and immediately found a large group of Ibis across the water, a couple of hundred feet distant. I put the scope through its paces, but despite careful scrutiny I failed to find the marks I was looking for. I noticed then that there were two more birds off on their own further south on the pond. As Shane has taught me more than once, it's important to be thorough, so I made the (possibly ill-advised) decision to walk south along the muddy shoreline to get a better look. After about twenty minutes of careful wading, I got myself into a better spot, and checked these two birds. I was immediately struck by the red eye of one--it was the White Faced Ibis, and obviously so. 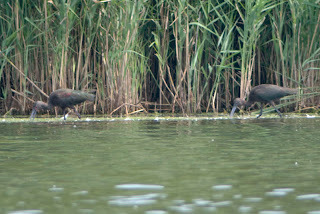 It was especially nice to have it feeding next to the Glossy Ibis, as that brought out the contrast even more clearly. I got some distant photos, and then spent another forty-five minutes or so walking around the pond to get some slightly closer photos. I ran into a European tourist along the way who tagged along to get my help with general IDs on the pond...I was happy to oblige as well as I could, having been the recipient of that sort of help countless times this year. As I was heading back to my car, I got another call from Shane's group (from Sean Sime)...this time it was American Golden Plover on the North End. This bird is expected in small numbers in the fall, so I didn't have to go right then, but as the old saying goes, "a bird in the hand..." I got out to the pond as Shane, Sean and Doug Gochfeld were moving on, and soon saw the plover, standing out on its own with a few other shorebirds and gulls. 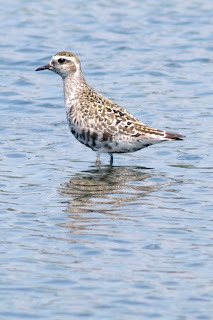 It was molting from breeding plumage, and had a distinct gold tone on its back (as opposed to the much more common Black Bellied Plover, which is more black and white), as well as the fieldmarks of some black still in the undertail coverts and a smaller bill. Again, got a few good photos, and back home to get work done and prepare for my trip out west. I took an early trip out to Jamaica Bay this morning with Tom Stephenson, hoping to see yesterday's White-Faced Ibis and whatever else might show up. 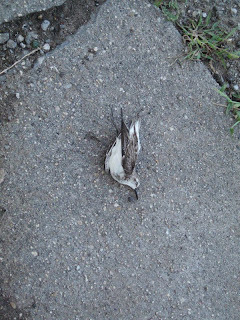 We didn't have much luck with any rarities (in part because the water levels were very high), but we did find a dead Semipalmated Sandpiper on the sidewalk. Semipalms are quite populous at Jamaica right now, and this one must have flown low and hit a car. This little death gave me a nice opportunity to look at the bird up close, and especially to see the webbing between it's toes for which it is named. 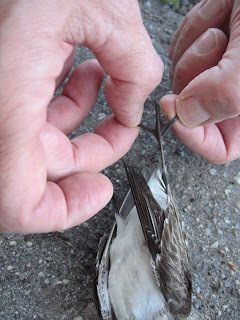 You can actually see this webbing at times on live birds, but this way is a lot easier. Yesterday was a busy day. My girlfriend Jessica and I had movers coming to help her move into my apartment, and we've been packing and getting ready for a couple of weeks. 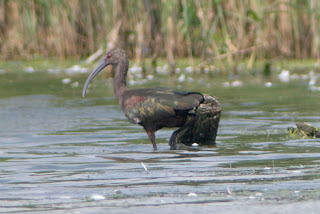 Everything was going to plan until I got a call at 9am from Shai Mitra...he'd found White-Faced Ibis at Jamaica Bay. I'd given up on this bird for the year because we've passed breeding season, and they are much more difficult to distinguish from the common Glossy Ibis when they are in non-breeding plumage. 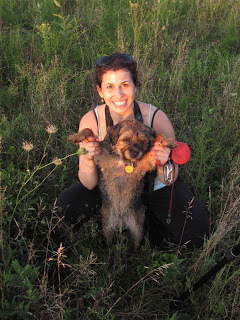 Nonetheless, Shai and Doug Gochfeld had managed it, and now I was apologizing to Jess and racing out to Jamaica Bay. The movers weren't coming until noon, so I had time to make a quick dash and back. Unfortunately, the bird flew, and has not been seen again. So I did my morning of birding and was back exactly at noon. OK...still on track for the move. 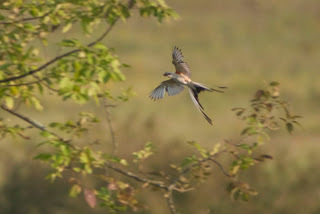 And then another call from Shai...Scissortail Flycatcher, seen the day before at Shawangunk Grasslands (near New Paltz), was being seen again. Against my expectations, it had stuck around. The movers showed up and I alternately watched the clock and got a good workout for the next four hours, hauling boxes and furniture up and down stairs. Things went quickly and at 4pm Jess and I were in the car and racing upstate. A traffic jam on the Deegan Expressway made it a closer call than it needed to be, but we got to the Grasslands with about 45 minutes of light left. No one was there, but the bird was, and we got to watch it perch and flycatch until sunset. It was a beautiful adult with bright red shoulders and a long, forked tail. We all enjoyed a little peace at the end of the day, and then headed back to our new home. The past few days I've been doing some intense Whimbrel hunting. Whimbrel is a large shorebird with a long, curved bill used for eating fiddler crabs. This time of year there are a few birds that come through New York...unfortunately, they don't stay long, and they are often seen as a fly-by or for a short time feeding in grasses or mud flats. In past years they have been seen in Shinnecock Inlet or Cow Meadow, or a few other spots on Long Island. I'd been working these spots over pretty regularly, with no luck. 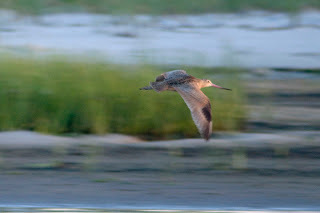 Then today I exchanged emails with Karen Fung, who mentioned that two Whimbrels were seen a couple of days ago on the North Fork of Long Island, in a spot called Cedar Beach. I didn't have a full day to work with today, but I figured what the heck and went into full-on chase mode. This means checking checking all the prime spots thoroughly but quickly and then moving on. I hit Cow Meadow first on the way out East, and at lunch I checked the Ponquogue Bridge at Shinnecock for its low-tide mud flats. No luck. I had just enough time to hit Cedar Beach before turning around, so I googlemapped my way there and started looking. At first it seemed like a regular, stony beach: not a lot of shorebird habitat. But as I walked my way around I found an inlet where there was a goodly supply of marsh grass and some little islands with flats. And there, on one of those islands, was a whimbrel. I just saw it briefly before it went behind some reeds, but I was able to change my vantage point and get some good (if distant) looks as it went back and forth, picking at fiddler crabs. Again, if I hadn't checked that spot at just that moment, I wouldn't have had that initial glimpse, and I might not have seen that bird at all. Luck and timing are a birder's best friend! On our way back to the car, Monkey seemed especially interested in some of the grasses by the shore. I figured he'd found a crab, but when I looked more closely I saw that he had found hundreds of them. There were crabs everywhere, scurrying along the shoreline and throughout the reeds. 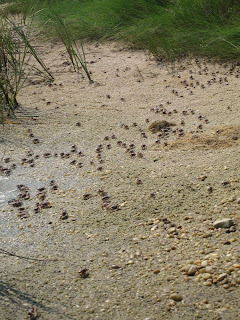 No wonder the Whimbrel was hanging out here...it's a fiddler crab buffet! After the excitement of the double-rarities at Jamaica Bay last weekend, things have been relatively quiet in migration. I've been checking Cow Meadow and Jones Beach, as well as Plum Beach and Jamaica Bay for early grasspipers and whimbrel. The grasspipers we will probably see in the area include American Golden Plover, Buff Breasted Sandpiper, and Bairds Sandpiper. We should also have Whimbrel come through (there have already been a couple of sightings in the past two weeks), as well as Western Sandpiper and Marbled and Hudsonian Godwits. 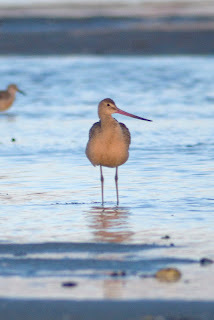 I was lucky enough to get a look at the Marbled Godwit that stopped over in Cupsogue on Monday. 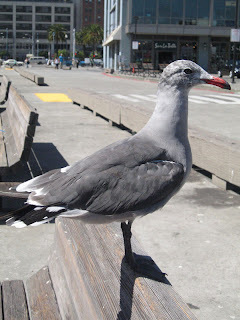 The bird was reported by Shai Mitra, and I went out the next day for it. It was a gorgeous day on the flats, and there were lots of shore birds and terns feeding in the late day light. I was working with the sun in my eyes, so I went to the west end of the flats and then worked my way back, and I got some nice shots of Red Knot and immature Common and Least Terns before spotting the Godwit feeding amoung the flock. Godwits have an upturned bill and are relatively large, so they aren't too hard to spot in a group. This one was in non-breeding plumage, but shone a beautiful golden color. Plum Beach is accessed via a rest stop on the Belt Parkway, and has a nice tidal flat that appears at low tide. 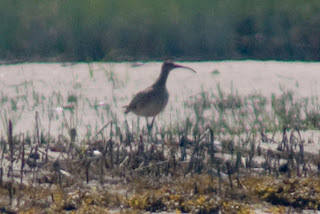 Whimbrel were seen there last week, but I didn't have any luck with them myself. 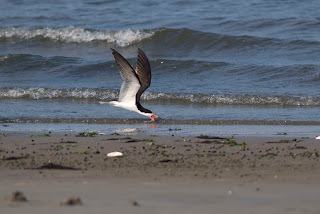 There were, however, a half-dozen Black Skimmers, which are one of my favorite birds. They were skimming in the shallows at the edges of the flats, and it's amazing to see how precise they can be as they drag their lower bills through the water for food. It was in that end-of-day light again, so it was a great photo op, and I a couple of hundred photos. I'm learning through the year that when you get a good opportunity to photograph, grab it! They don't come along that often, and you may not see that bird again until the next year. On Friday around mid-day I got a call from Shai Mitra...Red-Necked Stint at the East Pond of Jamaica Bay. Wow! 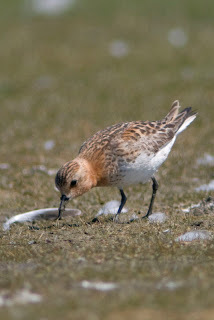 There have been four accepted Red-Necked Stints in NY State, and this bird was on my list of "True Rarities" for NY. While I still have a few birds to see that just haven't been around because of the time of year, it's the rarities that make up the "luck" component of my Big Year and will determine how many birds I actually see, and it's the rarities that are becoming more of a focus as the year rolls on. Out the door in less than five minutes, in the car and speeding to Jamaica. I called to reschedule one of the business meetings that I was going to miss. Then I called Shane, who was in the group who found the bird (the actual person who spotted it was Doug Gochfeld; Rob Jett and Bob Kurtz were there as well)...at the time they were not seeing the bird, but I decided to keep going and hope it turned back up. When I was about 20 minutes away I got a call from Rob that they had rediscovered the bird and were on it...I hit the parking lot and ran, putting on my gear as I went, but stopped dead when I saw that there was a large group of peeps right at the muddy entrance to the pond. I couldn't see the other birders and in my hurry I'd left my cell phone in the car. I couldn't see well out onto the pond, so for all I knew the Stint could be right here...I glassed the birds as best I could and didn't see anything obvious. Of course, Stints can be a difficult ID. I moved forward slowly, but there was no way not to flush the peeps...they took off as I reached the edge of the pond. Thankfully, I saw that the birders were actually some distance away and scoping the opposite bank. I trotted over along the muddy edge (straying from the edge of the East Pond can lead to dire, mucky consequences) and was soon with them. Bob gave me a quick look through his scope, and then I set up my own. And there it was...bright and beautiful, feeding on the far shore. The looks weren't ideal--we were several hundred yards away--but the bird was in good breeding plumage and really stood out with its bright orangey-red across its face and neck. I took a lot of very poor photos, and then thanked everyone and trotted back, hoping to make it back to NYC for another meeting I had. On Sunday I went back to Jamaica Bay, this time with Tom Stephenson and two of his friends, one of whom works for the Natural History Museum, and the other who works for the airlines and is doing a world-wide big year around urban areas. They wanted to see the Stint, and I was happy to go back, so were were wading out on the East Pond again around 8:30. This time the scene was quite different--the word had gone out, and there were fifty or more birders all parked on one side of the pond, and scoping in different directions. Seeing the scopes pointing different ways is not a good sign...if the bird is there, you should see everyone aiming at it. All the regulars of the New York birding world were there, including a few people who had driven down from Upstate. 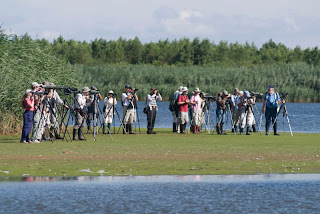 It was a festival atmosphere, everyone coming together over their shared excitement, and although you wouldn't want to be birding with fifty people every day, it's great fun every on special occasions. And there is a special benefit to having that many eyes in one place. Commonly referred to a s the Patagonian Picnic Table Effect (after Patagonia, Arizona, a famous birding locale), when you have a lot of birders in one place, stuff gets seen that might not have been otherwise. And we got a great example of that: before we had arrived, Seth Ausebel spotted a Sharp-Tailed Sandpiper. That bird is one of the few he could have seen that is actually rarer than the Stint for NY State (only 2 accepted records). It was not currently being seen, but it was likely on the pond somewhere, so we started looking. Happily, the Stint reappeared, and many people got first-time-ever views through their scopes. A group of us then moved South, scoping as we went. After twenty or thirty minutes a birds was seen across the pond resembling a Pectoral Sandpiper...that's very close to a Sharp-Tail. 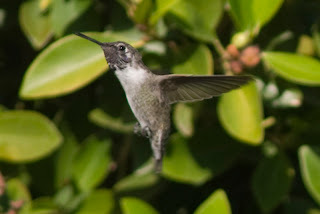 The light was poor, and the distance wasn't ideal, but after some close examination by the experts among us, and with a little change in light and angle, it was determined to in fact be the Sharp-Tailed. 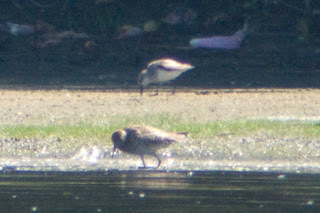 I got some more long-distance shots, and then turned back, only to find that the Stint had flown to our side of the Pond. We were able to get withing twenty feet of the bird, and got much more satisfying looks that I had on Friday, as well as much better photos. To have two rarities like that on the same day in the same place is spectacular. Both birds are from Asia, and either one showing up anywhere in the lower 48 is significant. To have both is one of those moments that birders will talk about for years to come, and it reaffirms the legendary status of Jamaica Bay as one of the best spots for rarities in New York.